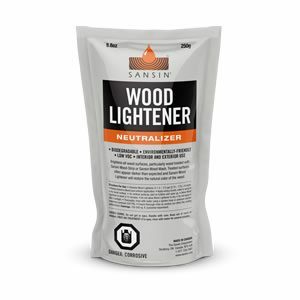 Sansin Wood Lightener is a concentrated, biodegradable cleaner and lightener for almost any bare wood surface. Wood Lightener works to help remove mold, iron and other stains and discolorations commonly found in wood while restoring the natural bright tone of bare wood – a critical step in making your transparent surface coatings look great. Wood Lightener is also available in 5 gallon industrial concentrated formula. View the Wood Lightener Product Data Sheet (PDF) for information about application, preparation, maintenance, and more. View the Wood Lightener Safety Data Sheet (PDF).